The lwa are usually worshipped in a vodou temple, the ounfò, which is headed by a priest (houngan) or priestess (mambo). Houngan and mambo preside over the rituals and initiate the vodou practitioners. The rituals are held in a large room, the péristyle. The spirits "enter" the temple by descending on a pole, the poteau mitan, which is located in the centre of the péristyle. The spirits take possession of some participants, whom they have chosen beforehand. The person possessed "serves the lwa", who has thus entered his or her body. In vodou there is no separation between body and soul. Rhythm, music, song, and dance are important elements of the rituals. Vodou - Art and Cult from Haiti. 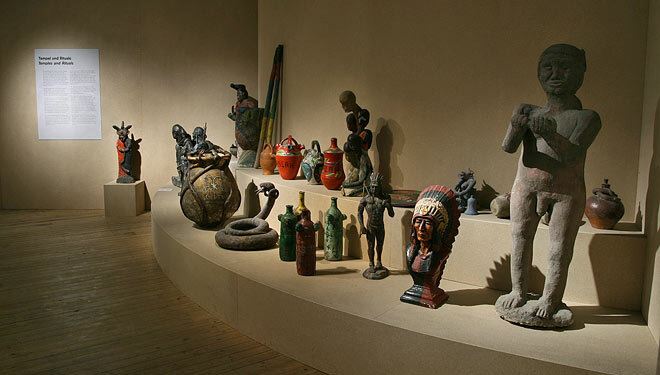 350 objects from the collection of Marianne Lehmann in Port-au-Prince. Photo tour through the presentation in Berlin, 2010.